How often do you read something that not only changes the things that you think about in life, it also changes the things you do? Garbology: Our Dirty Love Affair with Trash will likely have you analysing what you do with your garbage and it might just change what you typically buy at the store. I was fascinated to read what New Yorkers did with trash back in the late 1800s and had never thought about what people used to do with their “output.” I also found that this book got me thinking about what future innovations need to be created to deal with garbage. The title of Klein’s mind-opening book, This Changes Everything, accurately describes what I thought when I finished reading it. Klein spells out how globalization, many economic policies, and ideologies stand in the way of getting down to the task of reducing greenhouse gases and avoiding catastrophic temperature changes on the earth. She shows how changing trade laws could benefit the environment, how gaps exist in emissions attribution and elucidates many other ideas that I had never considered in depth. 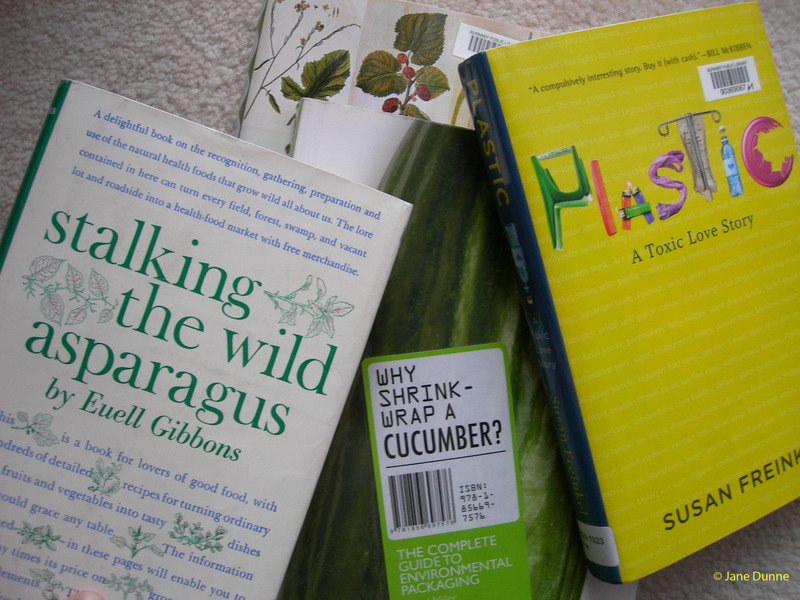 I think Miller and Aldridge’s book, Why Shrinkwrap a Cucumber, does a good job of explaining the competing environmental priorities when designing packaging for a product. The book details concepts like lightweighting and also gives examples of where a product may appear overpackaged, yet should be considered environmental due to the package’s ability to avoid waste. In other words, a plastic-wrapped cucumber that gets eaten in its entirety is better than one sold naked, but only a quarter is consumed before it goes soft and rotten. Gardeners often think about how humans have changed plants for our own benefit through selective breeding and engineering of seeds, yet Pollan’s book, The Botany of Desire: A Plant’s Eye View of the World, gets you to think about how certain plants have managed to manipulate us to help their survival. The author starts with how a bumble-bee is part of a co-evolutionary role, where plants have ingeniously manipulated bees into a role of pollination that benefits plants. Pollan then moves on to four different plants that represent four desires in human lives. In addition to co-evolution, topics like monoculture in farming and the impacts of human desires on the natural history of plants are covered. The World Without Us starts with this premise: what if humans were suddenly no longer on the earth, what would happen to all that we have developed? Weisman describes how our cities would turn back to nature and how other animals might evolve to fill our niche. This book gives the reader the highly-creative task of picturing human developments breaking down and makes you wonder what kind of legacy we are actually leaving behind. Susan Freinkel’s book, Plastic, brings attention to just how many things in our lives are made of plastic. She sets out to go an entire day without touching anything plastic, but quickly realizes that her toilet seat will necessitate touching plastic at least a few times and she decides instead to record all the plastic she comes in contact with in 24 hours. Her book enlightens on why our excessive uses of plastic should concern us and about the additives in plastics that can be dangerous for our health. Many environmental writers refer to Rachel Carson’s Silent Spring, so it serves as required reading for any reader of green books. This classic from 1962 shows how toxic insecticides can travel up the food chain and gives compelling arguments for using natural solutions to take care of imbalances, rather than using chemicals. Being optimistic about the future is not only motivating, it is empowering, so I searched for a book about humanity’s environmental successes. That search brought me to Wild Hope, a book that covers achievements in wildlife conservation and protection of wild habitats. It is uplifting to read about places where we have done the right things on this planet. My hope is that the lingering quality of the ideas presented in these 10 books will have you thinking and talking about them long after you’ve finished reading. Jane Dunne is a Senior Editor at Specialty Technical Publishers and she is currently working on an update covering new regulations regarding storm water for Environmental Auditing: Federal Compliance Guide.